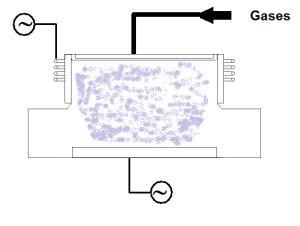 Deep Reactive Ion Etching, is a technique where the gases are introduced above an Inductive coil, placed around a ceramic tube. RF is applied to both the coil, and chuck to create a plasma. The substrate is placed on the RF powered chuck, and similar to RIE, the wafer takes on potential which accelerates etching species extracted from plasma toward the etched surface. Introducing different gases can create a chemical reaction. With this technique, etch profiles are typically anisotropic. A DC bias measurement can be taken from the chuck which can give a good indication of the amount of etching that is occurring. The main requirement on this type of processing is a very high etch rate so that you can etch through a Silicon wafer as a TSV, and this can be achieved by flowing large amounts of fluorine based chemistries. This technique is used for Deep Silicon etching, and is also known as a High Density Plasma source.